In shallow bowl, combine pork and taco seasoning mix; toss to coat. Heat oil in large skillet over medium-high heat until hot. Add pork; cook and stir 3 to 5 minutes or until no longer pink. Stir in salsa, beans and preserves. Reduce heat to low; simmer 10 to 12 minutes or until thoroughly heated, stirring occasionally. Meanwhile, heat taco shells according to package directions. 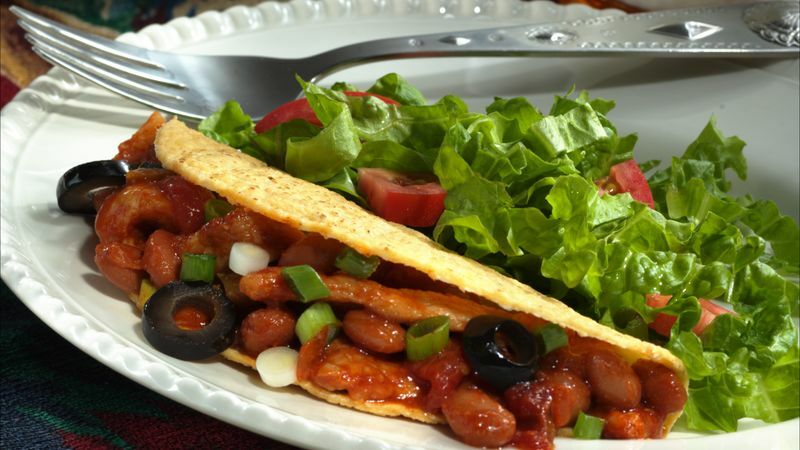 To serve, spoon 1/3 cup pork mixture into each taco shell; top with olives and onions.